The pages in this collection preserve a few press articles about Greg Scott and Infrasupport over the years. 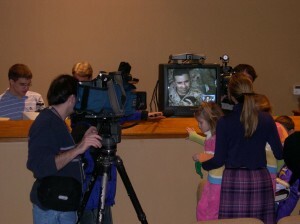 Twin Cities TV News Crews record every word of the first of many Eagan Hills Church services shared with deployed Marines in Fallujah, Iraq. Dec. 4, 2004.